Part Strategy. Part Puzzle. All Fun. Made by us for us. Many great projects begin with "Wouldn't it be cool if..." and Puzzle Football was one of those. 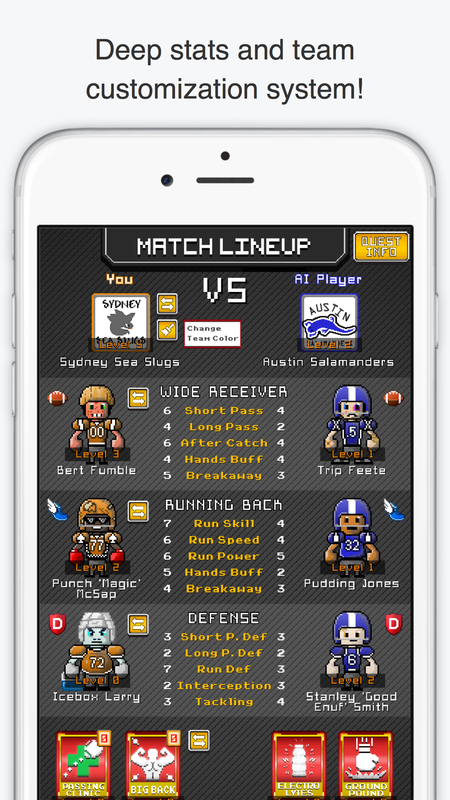 What started with a team chat about the state of mobile games in app stores led us to design, build, and publish our favorite mobile game to date, Puzzle Football. Creating a vintage football-inspired pixel art game required taking nuanced art cues from different eras. After many different concept explorations with plenty of trial and error, we created bright pixel style with an 70s color palette reminiscent of the earlier days of the sport. The game has a creative mix of American football attitude and strategy and simple puzzle gameplay. The PTE team seamlessly blended the best of both worlds to make a game that used points earned in the quest to super power your football teams to victory. The game is designed to to be equally fun in single or multiplayer mode. After inviting friends on Facebook, you can take turns asynchronously to play each other.